Shrink tunnels using a heated air system, it used for shrinkable films (PE POF PVC) that have been applied by L-bar sealers, sleeve wrappers, and sealing cutters. Designed for high production, the air flow technology is used to circulate the air to avoid bubbles and bumps in plastic film. Independent control systems regulate temperature, air velocity and conveyor speeds, our shrink tunnels feature carefully controlled air velocity and temperature that are maintained throughout the tunnel for optimum film shrink. The efficient heating system on each machine reduces the amount of electricity needed to run the machine, consequently reducing operating costs. 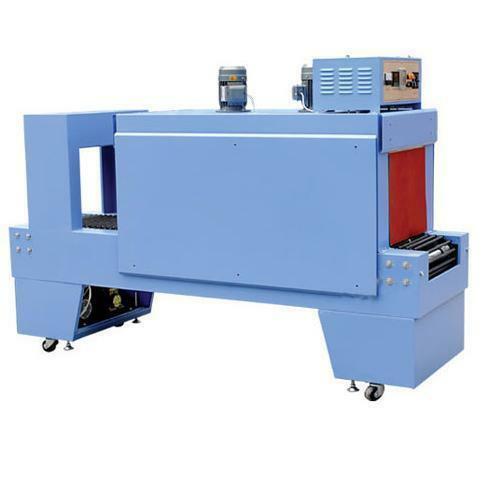 It is used to shrink pack goods, such as cans, glass bottles, , mineral water etc, in wood, rolled steel, ceramics, household appliances, computers industries and more. Incorporated in the year 2000, Shri Vinayak Print-Pack, Now Shri Vinayak Packaging Machine Pvt. Ltd. is a leading importer and supplier of packaging machines. The range includes semi / fully automatic packaging machines, strapping machines, shrink pack machines, band sealing machines, liquid packing machines, cappers, batch coding machines, Material handling equipment's etc. Our company has achieved notable growth and has become a progressive supplier of new generation packaging machines in India. Steered by a futuristic vision, we invest judiciously in building resources and execute day-to-day business operations with a higher level of professionalism and efficiency. We are a market-savvy company, with a customer-oriented quality deliverance approach that guides us to provide customized packaging machinery for specific packaging processes. Our prime focus is to create maximum utility and offer value for money to our customers. Hence, we make every effort to understand client's business and accordingly procure machines that meet their specific requirement to the fullest. Our prime motive is to play a crucial role in assisting clients to expand their business profits. Along with the understanding of customers' requirement, it is our time-tested business management methods, quality compliance, fair trading practices and responsive services that have carved a niche for us in our domain. Combining years of experience, we have made a strong presence in domestic market. In our endeavor to achieve complete customer satisfaction, we offer our clients products and services of a quality that is second to none in the industry.